Assembly arrays are a common and important requirement in many flex circuit designs to allow for component assembly. 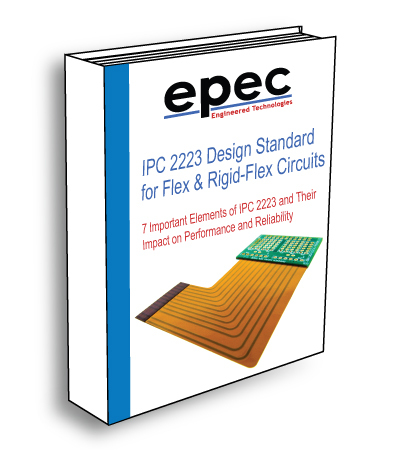 Flex and rigid-flex designs have a number of factors that require review above and beyond standard rigid circuit boards in order to ensure an optimum assembly array configuration. Flex and rigid- flex PCB arrays are generally smaller than that used for rigid boards. This is due to the larger dimensional tolerances of the polyimide materials used and larger inherent manufacturing tolerances. A reduced assembly size minimizes any dimensional changes across the extents of the array and ensures proper solder paste stencil alignment. In general, shapes found in flex and rigid-flex designs are more convoluted due to the design bend requirements and the integration of multiple rigid sections into one part. It is common to rotate, intertwine, and/or place parts on angles. This allows for reduced assembly array size and part cost due to higher production panel utilization. The size and location of rigid areas, in rigid- flex designs, rigidized areas, and in a flex designs, may impose limits as to how the parts can be configured in an assembly array. Generally, rigid areas are required to be adjacent from one part to the next to allow for breakaway tabs. Different stiffener thicknesses and whether a design utilizes Pressure Sensitive Adhesives (PSAs) may also impose limitations. Multiple assembly arrays are combined within a manufacture’s production panel size(s). Available production panel sizes will differ from supplier to supplier. Assembly array size in relation to the production panel, impacts the overall material utilization and part cost. Flex materials will vary in size and configuration depending upon the geographical location where the parts are to be manufactured. Domestically, materials are primarily supplied in 18” x 24” panels. These are then cut into to smaller 12” x 18” or 9” x 12” sizes. Off-shore materials are supplied in roll form with a 250mm width and 50 to 100mm in length. This results in different available panel sizes between regions. Off-shore production panels can be cut to different lengths allowing a greater variety of production panel to better fit the part and the assembly array and improve the material utilization. The most common solution for breakaways in rigid-flex PCBs are mouse bites - similar to standard rigid PCBs. For flexible circuit designs the common solutions are tabs. Tabs are the small uncut sections or the part outline. V-scoring may also be used for rigid-flex designs. A post assembly cutting system will be required to finish the V-Score cut and allow the parts to be separated from the array. V-Scoring will leave the centrally located flex layers uncut. V-Score is generally not used on flex only designs as the cutting process leaves an undesirable rough edge finish. The flex design must also have FR4 stiffeners thick enough to accommodate the capabilities of the V-Score process. We recommend to our customers that we review their design and propose an initial assembly array based on a review of the above items for their review and approval.